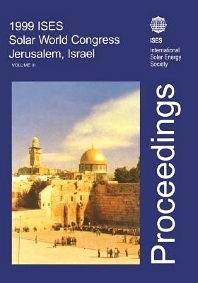 These volumes of Proceedings are the record of the 1999 ISES Solar World Congress, held in Jerusalem, Israel on the 45th Anniversary of the International Solar Energy Society. The Congress was held under the theme Solar is Renewable, adequately representing a meeting on the threshold of the 21st Century. The event also marks the 20th anniversary of the Israeli Section of ISES, founded in 1979 - the year ISES celebrated its Silver Jubilee. A business track under the title of Solar Means Business included presentations and discussions on market implementation of solar technology. The Congress further included two panel discussions and two workshops, dealing with WIRE (World-wide Information System for Renewable Energy) and with IPMVP (International Performance Measurement. These proceeding consist of the Keynote Papers and presented papers. For technologists, researchers and industrialists interested in Solar Energy as a renewable source of power. Financing of Private Renewable Energy Projects; Hurdles and Opportunities (L. Y. Bronicki). Solar Energy in the Built Environment: the Building as a System Plus the Systems In the Building (E. de Oliveira Femandes). Angular Selectivity of Seasonal Sun Protection Devices (A. Goetzberger, H. Wirth). Recent Developments in Photocatalytic Detoxification and Disinfection Processes of Water and Air (D. Y. Goswami).